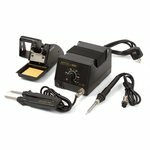 Soldering station with a soldering iron and SMD hot tweezers. Made of anti-static materials to protect sensitive components. 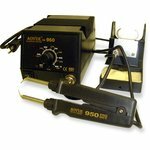 AOYUE 950 Hot Tweezers applied for mounting/demounting of electronic components, working with printed circuitry. Antistatic performance. It's recommended to use along with working platform Aoyue 328 or Aoyue 398 to get optimum results. 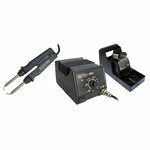 Made from anti-static materials to protect sensitive components. Compatible with Aoyue 936 (bought separately).